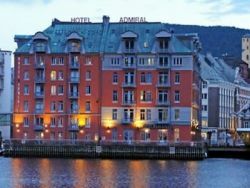 In Bergen, we'll be staying for 2 nights at the Clarion Admiral Hotel. Jutting out over the water of Vagen Bay, this polished hotel is housed in 1904-built warehouse buildings, across the fjord from medieval wharf area of Bryggen. Guests can enjoy complimentary Wi-Fi, laundry services, room service, a beautiful terrace with views of the harbor and pier, and an excellent restaurant featuring creative Scandanavian dishes by renowed chef Marcus Samuelsson. The breakfast buffet is served in a sophisticated restaurant with views of the vivid Bryggen houses, occasional live music and an international menu. Scandinavian design rooms features flat-screen TV, Duxiana beds, mini bars, desks, and some have view over the bay. The modern bathrooms feature rain showers, and reflect the understated elegance and Norwegian sophistication. 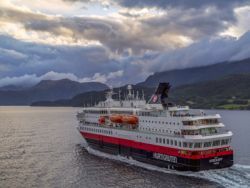 While cruising along the West Coast of Norway, we will be staying for 6 nights on Hurtigruten's M/S Nordkapp. Built in 1996 and refurbished in 2016, the Nordkapp ("North Cape"), sails the Norwegian coast linking Bergen to 35 ports as far north as Kirkenes. The ship features a modern, Arctic-inspired interior with 7 decks and 218 staterooms for a maximum of 458 passengers. The ship's amenities include a large forward-facing lounge, cocktail bar, 3 restaurants, two on-deck Jacuzzis, a bakery and ice cream bar, sauna, fitness room, library, gift shop and free Wi-Fi. The Polar Outside twin-room cabins feature two beds, one convertible to a sofa during the day, private bathroom with shower, and a large window to enjoy the stunning views of the Norwegian Coastline. The Arctic Superior single rooms feature double beds, a TV, private bathroom with shower, and tea/coffee-making facilities. As a part of the travel experience, the ship offers onboard lectures, activities, and demonstrations. The activities take place inside the ship and outside on deck, and they are related to the areas we'll be visiting. 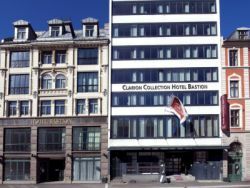 In Oslo, we’ll be staying for 2 nights at the The Clarion Collection Hotel Bastion. 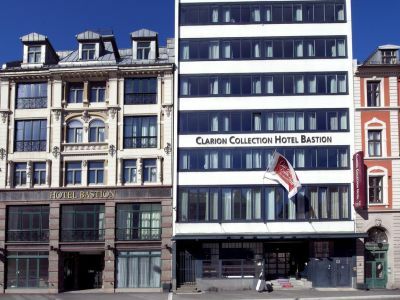 Located in the Kvadraturen area, the hotel is just a few minutes walk from Oslo's central station, Karl Johans gate, Oslo Opera House, and the Aker Brygge district. Modeled after British boutique hotels, the Bastion consists of two joined houses that each have their own unique style, one modern and the other classic, featuring free Wi-Fi, a lounge/bar, dining room, free afternoon sweets and coffee throughout the day, sauna, fitness center, currency exchange and laundry service. 99 brightly-colored rooms furnished with English decor are equipped with adjustable Jensen-beds, satellite TV, mini-bar, phone, ironing facilities, and modern bathrooms with a spa bathtub and shower, hairdryer, and luxury toiletries. In the highly unlikely event that our original accommodations must be changed, the alternative accommodations will be a hotel of equal or higher standard. No change will made to the cost of the tour.